Here’s a fun and easy Halloween card that you can make with very few materials. 1. Use your hobby knife to carve the top and bottom orange stripes of the candy corn shape. 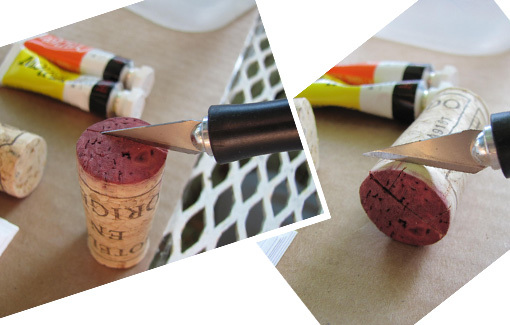 Start on the top of the cork and cut about 1/8″ to 1/4″ deep. Then cut in from the sides to remove the unwanted cork sections. 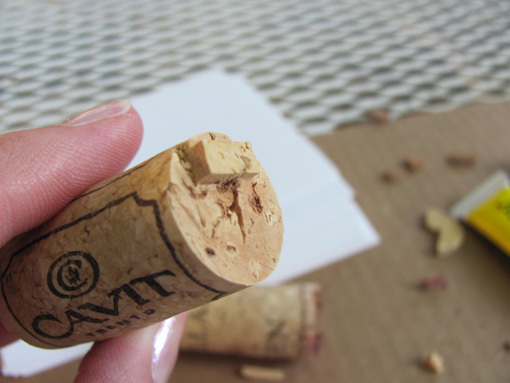 Go slowly as the cork cuts very easily. 2. 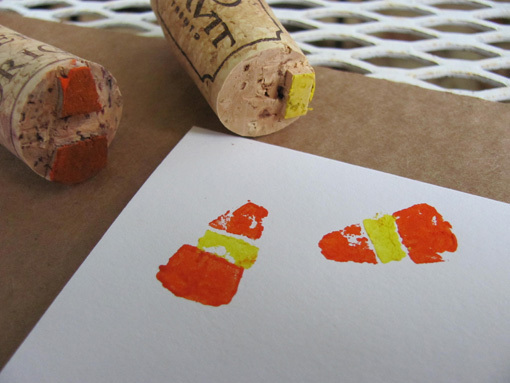 Out of the second cork, carve middle yellow stripe of the candy corn shape. 3. 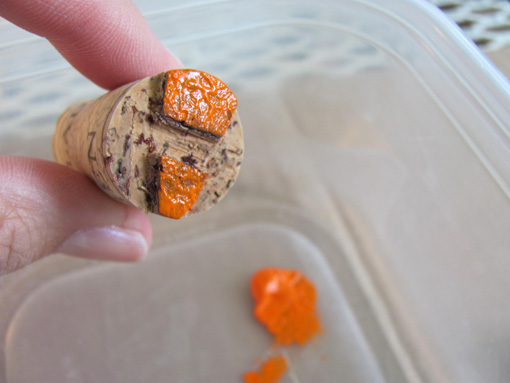 Dip your 2-stripe cork into the orange paint. With some pressure, stamp it onto your card. 4. 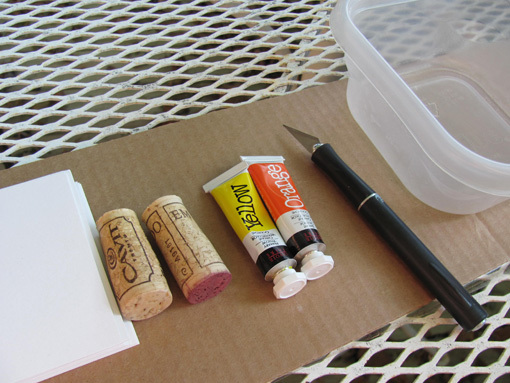 Dip your 1-stripe cork into the yellow paint. Aim for the middle of the two orange stripes and stamp. 5. 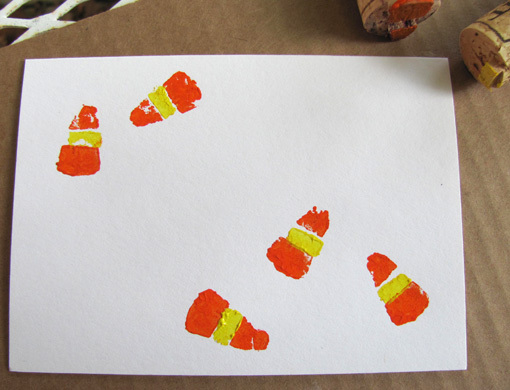 Make a fun pattern with candy corns! They look almost good enough to eat. *Note: you should do a few test stamps on a piece of scrap paper before you stamp your cards. 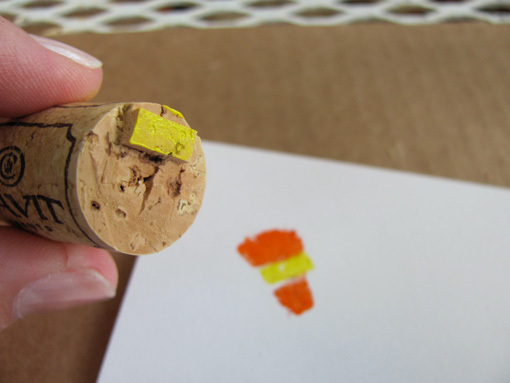 Because corks have varying textures and planes, you will probably need to adjust the pressure or amount of paint. Adorable! Great photos too! I have to try this! this is adorable!! I absolutely love it. SO cute 🙂 My 4 year old would love this…she’s been chomping at the bit to EAT some candy corns at long last. 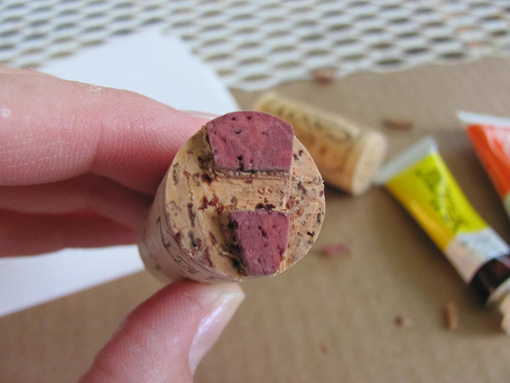 And this is a nice idea …using wine corks!